If you are a lemon lover like myself this homemade lemonade recipe is a must try for you. Nothing beats the taste of fresh lemonade. Homemade lemonade is not only simple to make but you get to control the amount of sweetness without and added preservatives or additives to the mix. Growing up your children might ask you if they can have a lemonade stand out front the house and I know Mr.CBB has mentioned that he has seen many kids with a lemonade stand at garage sales. It’s a great way for parents to be around to monitor their kids as they become their own bosses while the parents sell stuff they no longer need. It was my daughter’s birthday this week and if you follow me on Facebook you will know that I made her a princess dress cupcake. 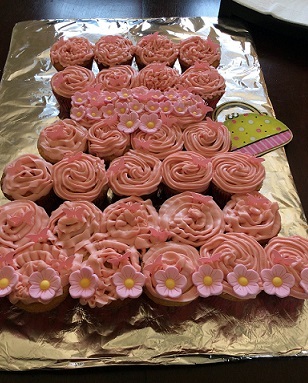 It worked out beautifully as she really wanted cupcakes for her birthday along with my fresh homemade lemonade. I can assure you I’m not a lemonade tycoon but I do enjoy making as much as I can at home rather than buying it pre-made. There are not many ingredients that go into making freshly squeezed lemonade other than the obvious, lemons, ice, water and sugar. This is the best lemonade recipe that I’ve ever come up with and I’ve worked at tweaking it so it’s just right, hence my secret weapon which you will read in the lemonade instructions below. Now if you have ever had homemade lemonade you know how refreshing it is on these lovely warm days sitting on the back deck, at a picnic or while you are out and about. I have a few secrets up my sleeve that will ensure that when you make this homemade lemonade for your friends they will think it’s store-bought. That’s how good this lemonade is. Another great way to use this lemonade recipe would be for a baby shower, wedding shower or any other gathering. If you want to make a lemonade punch for the guests it’s as easy as 1, 2, 3. 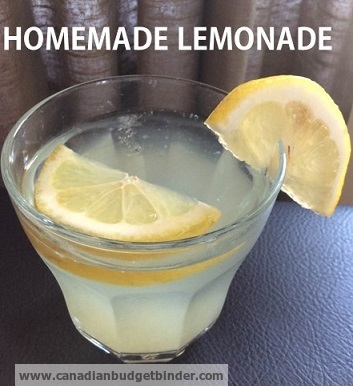 Switch this lemonade recipe up and turn it into a hard lemonade recipe…. easy! Who doesn’t like a refreshing lemonade and vodka? Many people enjoy vodka coolers and lemon vodka coolers are super popular this time of year such as Smirnoff lemonade or Mike’s Hard Lemonade. If you want to jazz up your party you can easily serve a lemonade cocktail such as vodka lemonade or a sparkling lemonade with Perrier and a slice of lemon and fresh mint to your guests. Be warned though that you better make a double or even triple batch of this lemonade as it will go down nicely. I agree that lemons aren’t cheap now costing about $0.60 each this time of year depending what grocery store you shop at. If you are lucky and have a farmers market nearby you might want to check to see how much they are charging. I enjoy making this lemonade as it can be used as a frozen lemonade to make Popsicles as well. If you are making freezies or Popsicles don’t add any more water as it will dilute it too much.You can also add strawberries or even blueberries to the lemonade mix and I promise you that your lemonade fans will be coming back for more! All it takes is a couple of ingredients to make this delicious homemade lemonade recipe which is ideal paired with my Biscotti biscuits or Baked Tzatziki Chicken. If you enjoy a refreshing drink with some zing look no further than this homemade lemonade. Don't spend your money on packets make it fresh and enjoy! First secret to make this is to place all five lemons into the microwave for 20 seconds. This will soften them and make them really juicy. Second secret is to peel the lemon. Try not to get the white pith and only the skin. I used a potato peeler. Squeeze all the juice from the lemons. Now place the sugar, lemon peel and 1.5ltrs of water into the pan along with the lemon juice and bring to a boil. Once it has come to a boil set aside and let it cool for 15mins. Now add to this the other 1.5ltrs of water and ice cubes. Taste if it's too sour then add a teaspoon of sugar until it's sweet enough. Well, I hope you enjoy this super easy lemonade recipe and let me know what you think or what you’ve done to make it your own. I know there are many variations that can be used to take lemonade to the next level but nothing is as refreshing other than a plain glass of freshly squeezed lemonade. Really is that should be! That looks good! Thanks for sharing Nicola! It does and that’s what I love about it. Simple is sometimes nice when it comes to recipes.